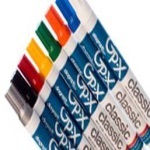 The Diagraph GPX permanent marker is an outstanding industrial marker. The GPX permanent marker is designed to mark on surfaces that traditionally are difficult to write on. The Diagraph GPX industrial marker will mark on metal, wood, rebar, steel, glass and other non-porous surfaces. This industrial marker can also mark on cardboard and plastics. 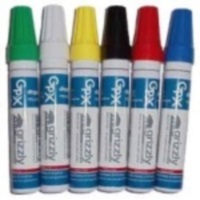 This Diagraph GPX marker comes in a variety of colors that are weather and fade resistant. Many companies will only use the GPX because of its outstanding qualities. At Boatman Marking we carry the GPX permenent industrial marker as well as other Diagraph products. 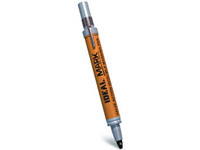 The Ideal Mark is the best industrial marker in production. It hass bee made for years and is the strong choice of many industrial companies worldwide. 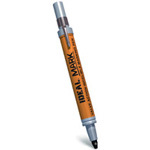 The Ideal Mark industrial marker has a valve action tip that allows you to pump more ink out when the tip dries out. The cost saving there is tremendous. No more throwing good markers out because the tips dried out. The Ideal Mark can be pumped back to life by pressing on the tip. The large volume of ink reserve lets the Ideal mark keep writing and writing. This permanent marker can mark on a variety of surfaces. At Boatman Marking we have a range of Ideal Mark industrial marker colors to choose from. GPX Grizzly Markers leaves a wider mark than the standard industrial marker. These GPX markers are able to permanently mark on porous and non-porous surfaces including metal, wood, corrugated, rubber, plastic, and much more.